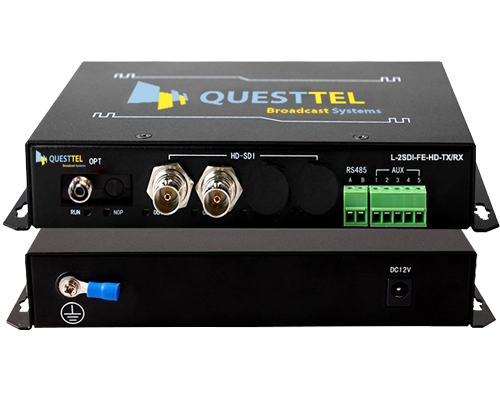 QuestTel's L-1SDI-FE-TX/RX is a compact factor high performance HD-SDI fiber extender for cctv and live video applications, which supports both singlemode and multimode optical transmission types. 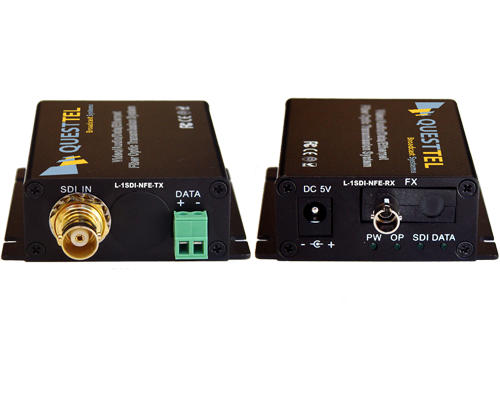 The L-1SDI-FE-3G-TX/RX is a SD/HD/3G-SDI over fiber transmitter and receiver extender kit. 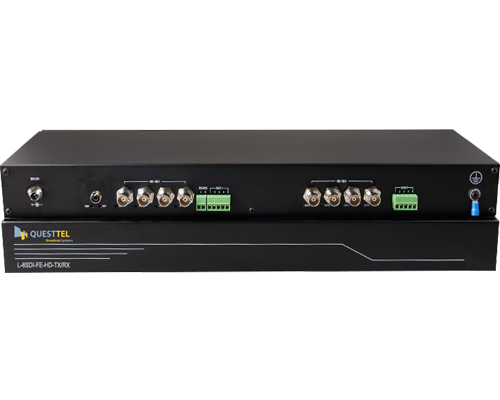 This unit provides optical transmission of one SD/HD/3G-SDI signal with embedded audio signal and has reversed RS485 data channel for camera control. QuestTel's L-1SDI/2IP-FE-TX/RX HD-SDI & Ethernet compact fiber extender provides transmission of one HD-SDI cnannel with AUX audio and two Ethernet IP channels over singlemode and multimode optical cables. 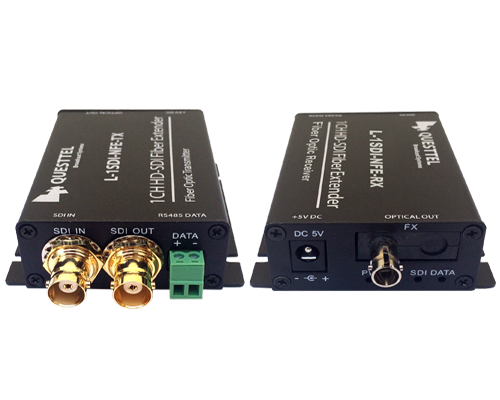 L-2SDI-FE-HD-TX/RX is a reliable high performance, 2-channel HD-SDI video over fiber transmitter and receiver extender solution, which provides real-time, loss-free HD-SDI transmission (audio embedded) over a single optical fiber cable, bi-directional RS485 data channel, and optional audio/contact closure/RS422/RS232 data transmission. L-4SDI-FE-HD-TX/RX is a reliable high performance, 4-channel HD-SDI video over fiber transmitter and receiver extender solution, which provides real-time, loss-free HD-SDI transmission audio embedded) over a single optical fiber cable, bi-directional RS485 data channel, and optional audio/contact closure/RS422/RS232 data transmission. The L-8SDI-FE-HD-TX/RX is a high performance, and reliable, 8-channel HD-SDI video optical transceiver, which perform real-time, loss-free and high-quality video transmission and one unidirectional (default)/bi-directional RS485 data over an optical line. 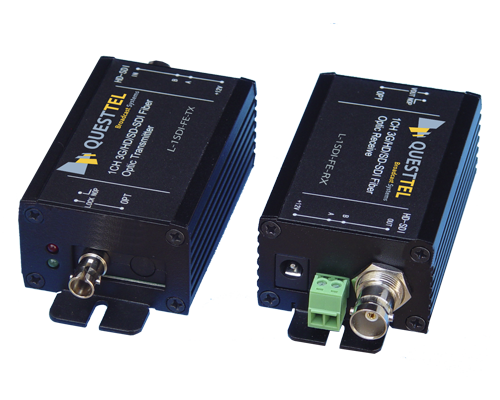 Extend 3G SDI video signal over singlemode fiber with analog audio and and additional gigabit Ethernet with QuestTel's L-XSDI-CWDM-3G-TX/RX transceiver. Our units specially designed for broadband applications and professional use, that's why they provide high performance and reliability as well as loss free transmission. L-XSDI-CWDM-3G-GE-TX/RX is an advanced business grade SDI over fiber solution featuring integrated Gigabit Ethernet channel, which is performed by two independent ports. 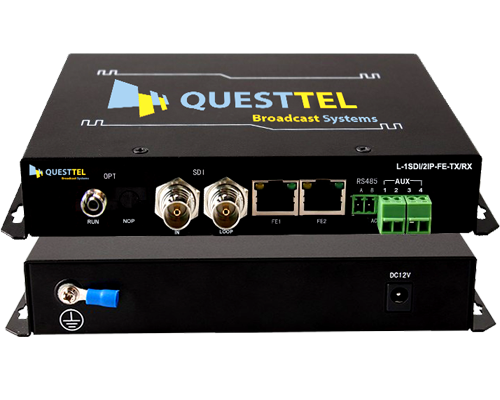 QuestTel's L-1SDI-FE-MN-TX/RX is a compact factor high performance HD-SDI mini fiber extender for cctv and live video applications, which supports both singlemode and multimode optical transmission types. 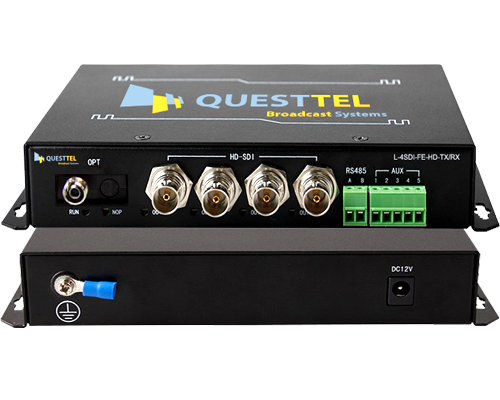 QuestTel's unique L-1SDI-FE-3G-MN-TX/RX is a miniature factor high performance 3G/HD-SDI mini fiber extender for live video and cctv applications, which supports both singlemode and multimode optical transmission types. 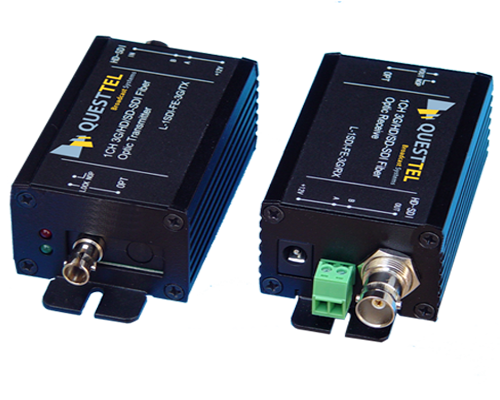 QuestTel L-1SDI-SFE-TX/RX is a HD/SD-SDI over singlemode or multimode fiber transmitter and receiver extender kit. This unit provides optical transmission of one HD/SD-SDI signal with embedded audio signal and has reversed RS485 data channel for camera control. 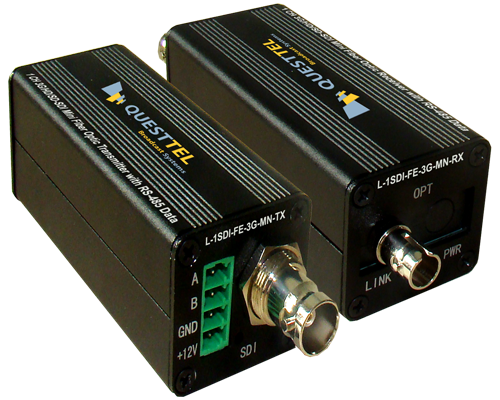 QuestTel L-1SDI-NFE-TX/RX is a HD/SD-SDI over singlemode or multimode fiber transmitter and receiver extender kit. 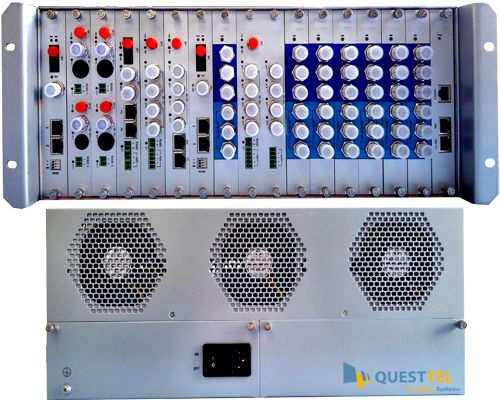 This unit provides optical transmission of one HD/SD-SDI signal with embedded audio signal and has reversed RS485 data channel for camera control also loop-out connectors on the transmitter & receiver for monitoring. 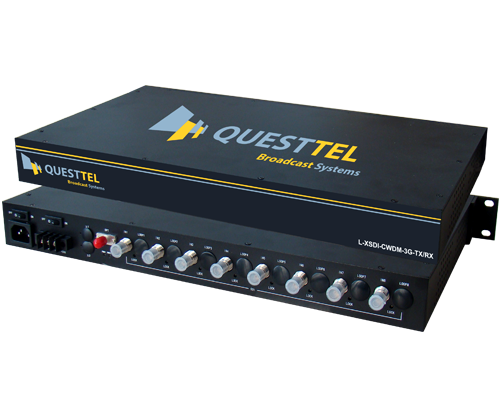 QuestTel's L-4SDI-FE-HD-TX/RX is a reliable high performance, 4-channel HD-SDI video over singlemode fiber transmitter and receiver extender solution, which provides real-time, loss-free HD-SDI transmission audio embedded) over a single optical fiber cable. 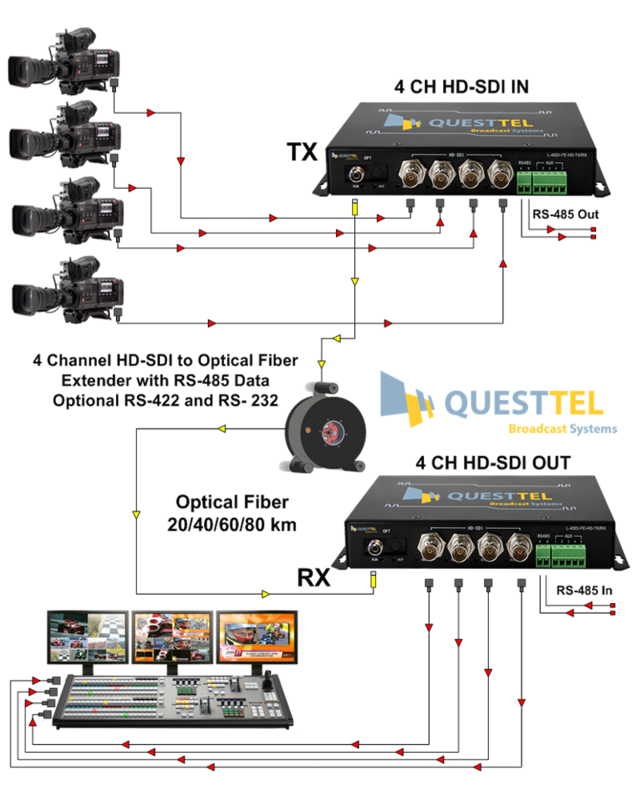 Furthermore QuestTel's 4CH PRO-SDI Gear provides a bi-directional RS485 data channel and optional audio/contact closure/RS422/RS232 data transmission, which can be widely used in TV live broadcast, high-definition video conference, high-definition video monitoring, intelligent transportation system and public security system. Fiber optical transmission excludes electromagnetic noise factor, it makes this product a perfect solution for efficient, reliable and secured SD/HD-SDI signal transport.